Abseil Victoria Falls is one of the most scenic abseiling site in the world. Experience Victoria Falls like never before with our comprehensive Tour of the Falls seeing both the top and bottom. 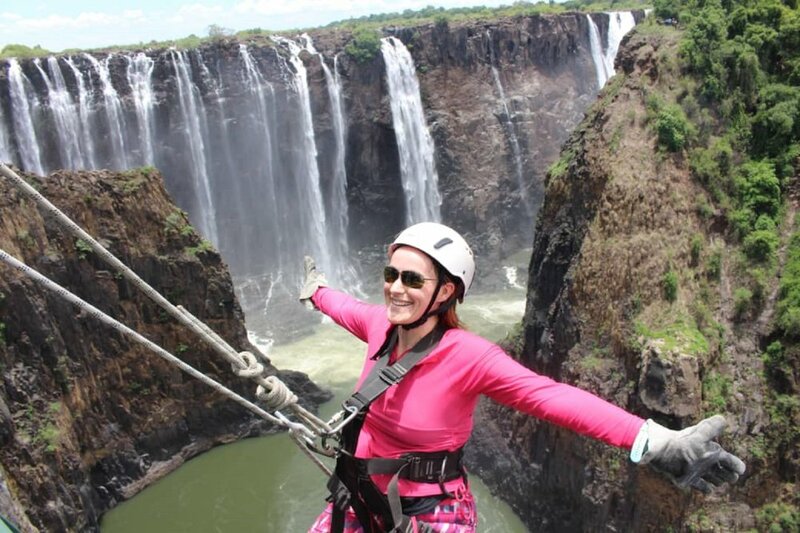 Abseil Victoria Falls is one of the most scenic abseiling site in the world with the backdrop of Victoria Falls, boiling pot and famous Victoria Falls Bridge. Your Abseiling tour starts right at the end of your Victoria Falls tour, our starting point is on the northern side of the park near the bridge. After signing and harnessing up a safety briefing is conducted including a practice session to get you ready to abseil 110m down whilst taking in the scenery. Experience Victoria Falls like never before with our comprehensive Tour of the Falls. Your Tour starts by our Guides picking you from your Hotel or Lodge for a free Guided Tour of the Falls. Our trained Guides will guide you right through the Rain-forest telling you the history and showing you all the unique viewing spots. After your scenic Guided Tour of the Falls, our launch platform is right at the end hidden behind trees, you are taken through a safety briefing for your Abseiling activity. You will go 110 meters down the Gorge whilst having an all-round view of the Eastern cataract of the Falls with the raging boiling pot right underneath you and a glimpse of the famous Victoria Falls bridge. Once at the bottom you are now gazing the untainted beauty of the Falls from below and the surrounding Batoka Gorge and the white-water rapids. Your exploration of the falls from below has just started. This is an exclusive part of the river with very limited traffic giving you the chance to take in the views of the Falls and the canyon wall. You will be fitted with a life jacket ready to paddle in a raft straight underneath the Falls. The scenic beauty of this area is breath taking. You will be blown away starring at the waterfall from below as well as seeing first-hand how large these waterfalls are. You will disembark the raft and begin your exploration hiking right at the foot of the Falls. Wait that’s not all your guide will lead you to the Rock edge pool for you to swim right underneath the spray. You will then go on a 15-20 minutes Gorge hike burning a few calories in the process. Once at the top of the Gorge light refreshments will be served and the driver will be waiting to transfer you back to your Hotel. This Tour takes 4 Hours. Thank you for sending us an email one of our team members will be in touch with you shortly.